As far as ideas for comic book tie-ins go, a series of “lost adventures” that take place over the course of any given series isn’t a bad one. Collected here are the somewhat inconsequential escapades that happened to the protagonists of Avatar: The Last Airbender across all three seasons, from Aang attracting a swam of scorpion-bees, to Sokka impersonating the Avatar to impress a girl, to Azula and Zuko challenging each other to an arcade game — even a two-page spread on Momo stealing some fruit. Although plenty of the stories in Avatar: The Last Airbender — The Lost Adventures (2011) are lightweight offerings that cover things like training or travelling or other bits of minutia (like what happens when the Avatar has a nightmare?) others are more lengthy, and help fill in some pretty important gaps that didn’t make it into the show itself: like how the Water Tribe managed to elude capture between seasons two and three by seizing a Fire Nation ship, or how Azula convinced Zuko to return home after Iroh’s capture instead of staying in Ba Sing Se, or what led to the Earth King’s decision to wander the world. There’s also plenty of fan-service, such as a much-anticipated flashback to Aang’s Fire Nation friend Kuzon, and a showdown between Toph and Bumi as they fight to see which one’s the best earth-bender (a source of much discussion in fandom). Yet others could have easily been adapted into full television episodes. “Private Fire” involves Sokka coming up with the brilliant idea to join the Fire Nation army as a way of gaining intelligence on their enemies. With a little more beefing up, it would have worked much better than the real episode “The Headband” in which Aang goes undercover at a Fire Nation school for a similar objective, but ends up throwing a dance party instead. There’s also the poignant “Relics” in which Aang thinks he’s on the trail of some surviving airbenders, only to discover how they were all eradicated in the first place. There are also two concluding stories which aren’t meant to be considered canon — one, for example, has all the characters drawn in chibi style and involves them attending gym class together. 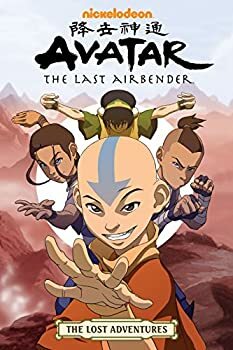 Avatar: The Last Airbender — The Lost Adventures is a mixed bag of goodies, with art that ranges from “very good imitations of the show’s design” to “badly-coloured disfigurements that that are hideous to look at”. Thankfully the former far outweighs the latter, and any long-time fan of Avatar: The Last Airbender will be happy to have all these comics — many of which were published in a variety of other Nickelodeon magazines — bound together in one volume. Think of it as a supplement to the television show, not self-contained stories to be read by someone unfamiliar with their larger context. Published in 2011. For three years, millions of eager fans tuned in to watch new episodes of Nickelodeon’s hit animated series Avatar: The Last Airbender. Ever since, fans have been hungry for more&mdash;and now their wait is finally over! 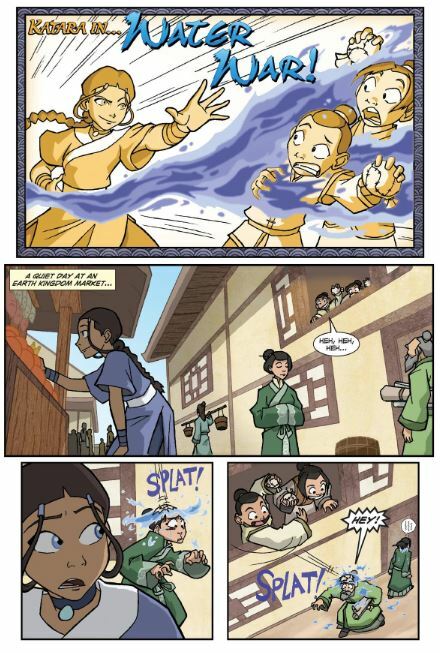 This volume collects the long-out-of-print, fan-favorite comics previously published in Nickelodeon Magazine and with the Airbender DVDs, plus over seventy brand-new comics pages. That’s twenty-six stories set in Airbender continuity, by a host of top-notch talent, many of whom worked on the original animated series! * A must-have for any Airbender fan! * Twenty-six in-continuity stories, plus bonus content! * The latest release in an ongoing partnership between Nickelodeon and Dark Horse, to bring you the very best in Airbender books!